What did you think of "Asoka"? I have this one on my wishlist, but I haven't bought it yet, because the better DVD releases I have seen have the shorter 169 min cut on it. As far as I know there is a 180 min cut. Seeing that you like "Jodhaa Akbar", I think Bollywood movies could be generally something for you. My first Bollywood movie I have seen was also with Hrithik Roshan. It was "Krrish", Bollywood's first superhero movie since "Mr. India" from the 80s. He is quite famous and have seen Krrish referenced in a few other modern Bollywood movies. 5 or 6 songs per movie is about the correct average. Especially for the 3h+ kind. A lot of modern Bollywood movies are shorter now. They clock in at around 2.5h. Another movie I have on my wishlist is "Lagaan". Of what I have read, I think you would enjoy it as you like "Jodhaa Akbar". It's by the same director. Asoka is one I went to the cinema to see when it came out here, October 2001 according to IMDb. From what I can recall I did enjoy it but for some reason I never transferred that into a DVD purchase, it is very probable that I was cutting back on purchases when that came out on DVD. Thanks, I will give them a go. I have Love Aaj Kal to watch and Race on pre-order. I will also look into the reviews here. "Lagaan" is really recommended! I like that movie - it was one of my first Bollywood movies I've seen on tv. I finally came around and ordered Lagaan myself. I want to use it for my "L" in the alphabet marathon now. Looking forward to your review of it. I will try to watch my copy soon. Overview: Hot on the heels of SHAOLIN SOCCER, Kung Fu Dunk is a dazzling collision of hi-impact martial arts and re-hot sports action from the action-director of HERO and HOUSE OF THE FLYING DAGGERS. Orphaned from birth, Jay is raised in a martial arts school, and becomes a prodigious master in the ancient art of Kung Fu. When he is expelled for overshadowing his teachers in an epic showdown, he quickly learns that lightning fast reflexes are good for more than just fighting, and agrees to play for the college basketball team in exchange for information on his long-lost family. 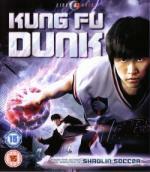 Showcasing the breathtaking talents of one of action-cinema’s brightest new stars, KUNG FU DUNK delivers a high-velocity, hoop-tastic thrill-ride that will have you cheering for overtime! My Thoughts: An enjoyable martial arts/sports romp, although not heavy on the martial arts. No real surprises to catch you unawares. AD 476. The Roman Empire is crumbling and the last Emperor, Romulus, is fleeing for his life. His only safety is to be found in the hands of his bodyguard and an enigmatic Byzantine warrior. His only sanctuary lies in the far-flung western outpost of Britannia, it is a perilous trek across a continent in search of a long forgotten elite legion of Roman soldiers. When Rome is sacked by an army of Goths, the Empire Romulus was born to rule falls, now a new myth, destined to span the centuries, is waiting to rise. Imprisoned and desperate, Romulus's destiny unravels as he discovers a mythical sword holding an ancient prophecy. My Thoughts: To be honest I was expecting a hack and slash or sword and sorcery film but in the end this turned out to be a quite enjoyable romp through Roman history at the end of the Roman empire and leading to the Arthurian legend. Everything and everyone seemed to come together and play out well. Overview: From Jennifer Aniston and the producer of 'Sliding Doors' comes a romantic comedy that shows love just who's boss! When straight talking business woman Sue Claussen checks in for a single night at the roadside motel owned by Mike's family in Arizona, what starts with a bottle of dreadful champagne "compliments of the management" evolves into a bumpy ride toward true love. Eventually. You see, Mike's an aimless dreamer and bets his whole life all on a trip to visit Sue across the continent in Maryland – only to find she has no place for his impulsive charms in her carefully ordered, buttoned down life. Obsessed with making a difference in the wold, Sue has gone back to her yogurt mogul ex-boyfriend Jango. But Mike's not convinced. Having found the love of his life, Mike pits everything he has against Sue's safe, conservative existence. Only then might he persuade her that their place in the world just might be together. My Thoughts: A rom-com that doesn't really surprise in any shape or form. The protaganists meet and part and meet and part and finally meet again. During the final time apart they come to realise aspects about themselves that they change ready for the finale. Overview: Nanny McPhee and the Big Bang is the next chapter of the hilarious, magical and heartwarming fable that has enchanted children around the world. Emma Thompson returns as the mysterious nanny who appears when she's needed the most and wanted the least. This time, she finds herself at a family farm where mayhem has broken out between some boisterous country children and their spoilt city cousins. Relying on everything from a flying motorcycle to a tree-climbing piglet, Nanny McPhee conjures up just the right formula to teach her charges five new lessons. My Thoughts: A fairly enjoyable romp. A decent retread of the original Nanny McPhee. Everyone seemed to play their parts as caricatures especially Rhys Ifans as the spivvish Uncle with shades of Flash 'arry from St. Trinian's, Minder's Arthur Daley and the spiv in Dad's Army. But overall enjoyable. I want to see this one. It hasn't even been in the theater here yet. I think it is just going to be called Nanny McPhee returns when it is out here. Yes IMDb shows that as the US title. I hope you enjoy it, I'm presuming that you saw the first one. Yes. I have that one on DVD. I really liked it. Overview: MARTIAL ARTS LEGEND TONY JAA IS BAK! This jaw-dropping new film features some of the most breathtaking fight sequences ever seen. Battling his own demons, Tien (Tony Jaa), must fight to avenge the slaughter of his beloved family. Trained by vicious outlaws, he evolves into a dangerous and feared warrior, his lethal skills perfected to the point where he is able to exact a terrible revenge on the men responsible for the murder of those closest to him. Following the ground breaking global success of 'Ong Bak' and 'Warrior King', Tony Jaa once again brings his sensational skills to bear in one of the most eagerly anticipated martial arts films of recent years. My Thoughts: I've enjoyed the other Tony Jaa films I've seen and in general enjoy martial arts films but this film hmmmm. I don't know whether it was because Tony Jaa wrote, directed and produced this film but it seemed to me to be disjointed. There was plenty of action and weapons but it was almost as if the actions scenes were all filmed and then they had to make up a story to combine them and if necessary repeat a flashback to take up a bit more time. Then the ending seemed to be - OK we've reached 90mins so we'd better end this somehow so let's have confusion from stupid plot devices and end with no clear resolution.